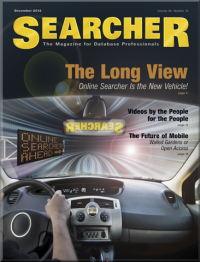 Searcher: The Magazine for Database Professionals is a unique publication that explores and deliberates on a comprehensive range of issues important to the professional database searcher. The magazine is targeted to experienced, knowledgeable searchers and combines evaluations of data content with discussions of delivery media. Searcher includes evaluated online news, searching tips and techniques, reviews of search aid software and database documentation, revealing interviews with leaders and entrepreneurs of the industry, and trenchant editorials. Whatever the experienced searcher needs to know to get the job done is covered in Searcher. This site contains selected free full-text articles and news from each issue of Searcher. Articles from past issues of Searcher are available in a variety of formats — Preview, Full Text, Text+Graphics, and Page Image PDF — on a pay-per-view basis, courtesy of ITI's InfoCentral.